Festival Theatre, Adelaide Festival Centre, Thu 5 Apr. This musical version of L. Frank Baum’s beloved children’s tale is an appealing mix of fantasy, fun and wonderful new musical additions courtesy of Andrew Lloyd Webber and Tim Rice in their first theatrical collaboration for 30 years. Most loved for the classic 1939 film starring Judy Garland (and often described as the world’s best picture), this version needed to be pretty spectacular to live up to such lofty standards. Director Jeremy Sams has remained faithful to the movie and 21st century theatre technology certainly plays a major role in bringing this fantasy tale to life. A sepia-soaked Kansas farmyard appears onstage, echoing the dusty, monotone opening scenes of the film. See through front projection screens and wonderful digital artworks create awe-inspiring visual effects, particularly during the early tornado scene. 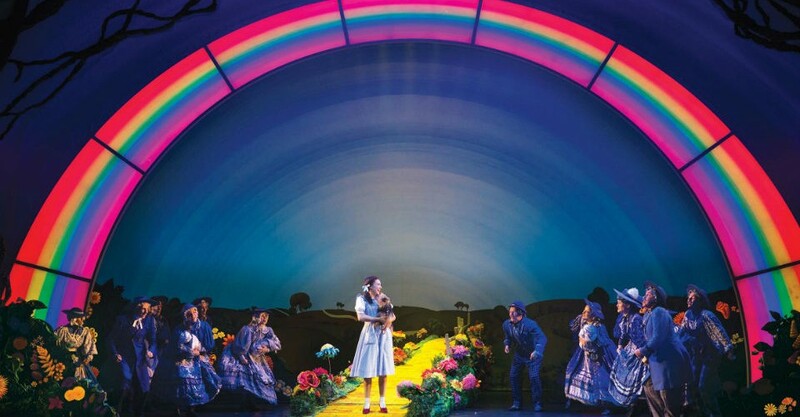 An amazing neon rainbow dominates the stage when Dorothy arrives in Munchkinland, the stage version of that old Technicolor style evident in the beautiful lighting throughout the production. As Dorothy, Samantha Dodemaide is a mix of sweetness and strength; her portrayal of this iconic character completely spot on. Her version of perhaps the world’s most famous song, Over The Rainbow was beautifully sung with all the emotion needed to carry such a tune. She did have to contend with the constant fear of being upstaged however, in the form of adorable terriers Flick and Trouble, alternating in the role of Toto. Collective sighs of puppy-love swept across the theatre each time Toto made an appearance. In multiple roles as Professor Marvel, an uncredited almost-unrecognisable cameo and The Wizard himself, Anthony Warlow demonstrates a mastery of theatrical characterisation. His stunning voice was used to superb effect, particularly when performing Bring Me The Broomstick. Jemma Rix, as Miss Gulch and Wicked Witch of the West was gruesomely green and wonderfully wicked as always while Lucy Durack shimmered in her role as Glinda the Good Witch of the North. It’s no surprise that sentimental favourite is saved for the Scarecrow, played beautifully by Eli Cooper. He was ably supported onstage by Alex Rathgerber and John Xingavelonis as Tin Man and Lion respectively, rounding out an energetic and comedic trio that the audience responded to with great delight. This production is wonderfully appealing and a musical and visual treat for children, young and old alike. Finding home is all in the heart. The Wizard Of Oz continues at, Festival Theatre, Adelaide Festival Centre, at various times until Sun 29 Apr. Book at adelaidefestivalcentre.com.au. Click HERE to purchase your tickets. A wonderfully appealing musical and visual treat!